Beppe Rinaldi explores the history of Barolo and his thoughts on its growing and making in the video at the end of this post. There’s an overall theme to Rinaldi’s wines. It’s one of exceptional fruit quality, balance, expressive personalities and great beauty. Apart from the 2006 & 2007 Brunate that were sadly looking a bit tired. You’d happily devour any of the wines we drank on the night. The highs from this winery are very high indeed. Drinking a set of 12 allows a rare insight into this exceptional maker. The opportunity to critically, take time drinking them, compare and contrast such wines is unique. It’s in these circumstances that you can really push your wine thinking, and explore what a great bottle really is for you. A huge shout out to Anth D’Anna and his mentor ‘Il Professore’ for putting on such a sensory feast! Before exploring them in detail. I have to say that several of these wines were among the best Baroli I have drunk, and, I have dunk more than a few. This is truly one of the great producers of the world. The most thought-provoking facet of these wines for me was the texture and quality of tannins in the wines. The fruit quality and the bold fruit of the 2010’s. The different personalities of the two wines. The mouthfeel of the 2008’s, the 2009’s, and, the 2010’s showed intriguing differences. The tannins in the 2008’s were a little edgy. Perhaps a tad green. Stand-alone the 2009’s had much more layered, riper tannins, of more depth. When we got to the 2010’s, extra layers of tannins, with great depth of tannin shone through. Again the pairs of 2008’s, the 2009’s, and, the 2010’s showed intriguing differences. The Brunate-Le Coste from 2008 had a spectacular perfume, wine of the night until the 2009 Brunate-Le Coste was revealed. Simply got lost in the scent of this incredibly special wine. One of the rare moments were the particularly noisy room faded into the background and I was lost in the glass. Entrancing wine of incredible sophistication, a perfume of complete harmony lifting out of the glass. The area of fruit character is where the 2010’s currently have me thinking. I’ve had quite a few now. 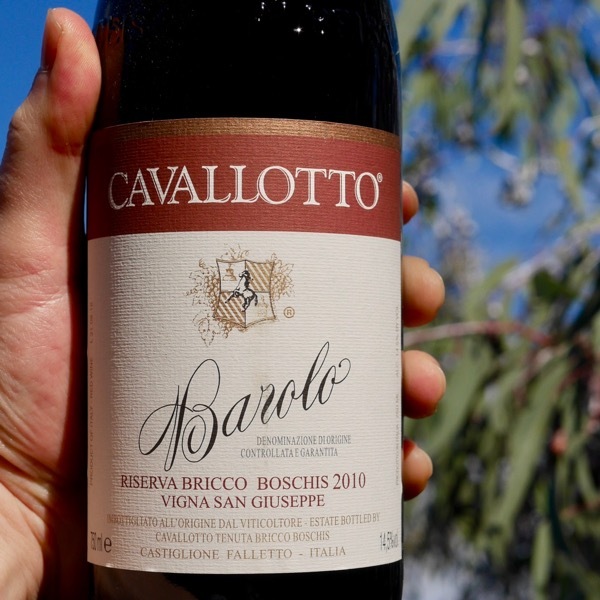 Have devoured a Cavallotto Bricco Boschis ‘San Guiseppe’ Riserva just the week before this tasting and a Giacomo Conterno Cascina Francia not that long ago. The fruit is incredibly rich, yet fresh, bold with great depth and length. Yet with the Rinaldi and Conterno, in particular, I felt like they lost a little identity and didn’t have the sophistication or intrigue that I desired. There is no doubt they are very special wines. Every time we’ve had the Rinaldi or Conterno wines it was the vintages either side that shone through. Perhaps it is simply a matter of patience and allowing them to reach the next phase of development where secondary characters with come forward and the fruit will dial down a little in volume. Generally the more feminine nose, perfume, enchantment and sophistication with more pure fruit flavours. Savoury darker fruits with spice and earthiness. Slightly more rustic tannins. Developed with an edge of wet wool, slightly oxidised. Edge of volatility and lift. Underneath you could see the was at some point an incredible core of fruit. Lovely tannins and fine acid. Complex, past its prime. Vibrant excellent core of fruit with amazing depth and length. Still so youthful. Tannins, much more masculine. Dark, cherry fruit with brown spice and earthy notes. Layered with excellent harmony. Edge of VA, oxidation. angular, acidity sticking out without the fruit to support it. Again can see the potential that would have been had it been a good bottle. Lovely harmony, layering, Exceptional dark, long fruit that lingers. Beautiful tannins, great balance. Hints of earth, savoury notes, and, violets. Lick of rosemary and fennel. Subtle and refined. Yes! Beautiful vibrant core of fruit. Such lovely florals. Exceptional. Fennel with earthiness. A little bitterness in a good tarry way. Edgy mid-palate tannin. Like the acid that is right on the edge. Such an entrancing nose that draws you in and dances through. Palate isn’t quite as sophisticated texturally. Savour dark, spiced. More depth. Rustic edgy tannins. Liquorice. Brooding, tightly wound at the mo. Waiting for it to explode. Exceptional fruit. Some lovely secondary characters and texture just need to relax and give a little more. Here we see a shift in tannins, riper and more layered than the 2008’s giving the wine greater harmony. The nose stepped up again from the 2008 Brunate. Extra personality, just draws you in. Sophisticated and playful. One of those wines you’re happy just smelling. Incredible feminine perfume. Exceptional length of rich dark fruit. Savoury, liquorice. Slight blip in the length of tannin toward the back. Exceptional front, mid, fruit. Dark, expressive. Initially luscious, then tannins build. I find myself conflicted by the 2010’s from Rinaldi. On one hand, they have exceptional, depth and length of fruit. A boldness to the fruit. It will be interesting to see if it resolves over time and offers a little more delicacy. Bold fruit, with very ripe layered tannins. There is something a little clumsy about it at the moment. This is an exceptional wine, I just have to call it as it is now. Looking for a little more finess to come through. I suspect and hope that as it matures it will resolve and a little more personality will come through. You could see the mark of the producer in the quality of the fruit. At the moment this is a little angular and clumsy. Still making its way through puberty, showing great potential. Just an edge raw at the moment. Still needing tile to settle and express itself. The balance is there, the core of fruit it there, some lovely tannin. A curious passionfruit and popcorn aroma will undoubtedly diminish and allow the real fruit through! White truffles from Alba and pasta was undoubtedly the food and wine combination of the night with the 2009 Brunate-Le Coste Barolo. 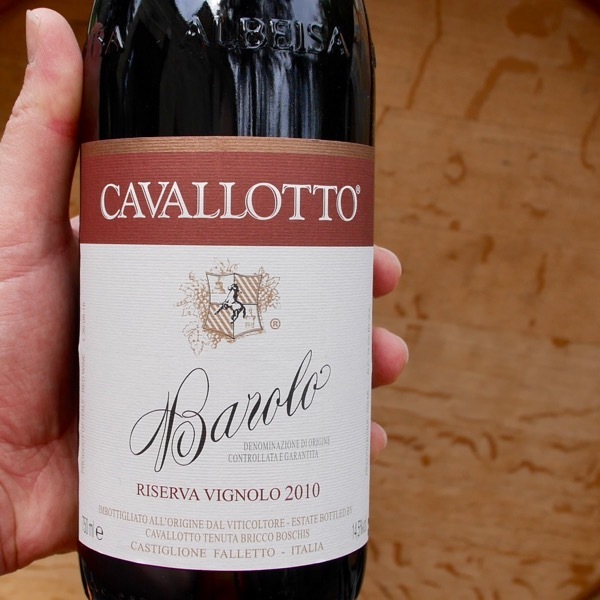 This is one of the benchmark traditional Barolo's. from one of the great years!